Ewan Kyle with the island kingfish that he caught near Kosi Bay. Note the midlateral brassy elliptical spots in this species. The dark body might indicate a male in breeding colour. Photograph by Scotty Kyle. Scotty Kyle sent in this photograph of a kingfish that his son Ewan caught. Ewan was using light spinning tackle on "dropshot" bait from the rocks at Turtle Pole "10" which is ten quarter miles north of Bhanga Nek. Ewan said that the fish took him right below the ledge on which he was standing and it looked as if there were about three other similar fish following the one he caught. Ewan's fish was 560 mm TL and was tagged and released. The photograph was sent to Bill Smith-Vaniz, an expert on kingfishes, family Carangidae. He identified it as the island kingfish Carangoides orthogrammus. Adults have some elliptical yellow spots (often with dark centres) present midlaterally. The leading edge and tips of the median fin lobes are dusky; the tail fin is also dusky with darker trailing edges and lobe tips; pelvic fins are white. Island kingfish have two dorsal fins, the spinous fin is very low, the second dorsal fin falcate but usually shorter than the head length. Lips become fleshy in large individuals and they develop a terminal snout. The curved portion of the LL is subequal to or slightly longer than its straight part. This species is mainly found around oceanic islands and is rare inshore in the neritic zone over the continental shelf. It is associated with reefs, feeds on small crustaceans, and attains 75 cm. In the WIO this species is known from Kenya, Aldabra, Seychelles, Chagos and south to central Mozambique. 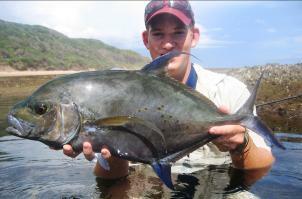 Bhanga Nek is a new fish distribution record for South Africa. A 30 cm FL blue kingfish Carangoides ferdau. A 20cm FL juvenile and 70 cm FL adult yellowspotted kingfish Carangoides fulvoguttatus. small golden spots on the upper body. The island kingfish may also be confused with the yellowspotted kingfish Carangoides fulvoguttatus. The yellowspotted kingfish has yellow spots on the upper part of the body and large adults also often have 2—5 black spots midlaterally near the rear of the body. While fishing at ~200m in Diepgat Canyon, Sodwana Bay, for fish that live in the same ecosystem as coelacanths, Lucy Scott caught an alfonsino species new for South Africa. The alfonsinos were two immature females of 188—209 mm SL. The fish were later identified as the Russian alfonsino, Centroberyx druzhinini. This Indo- West Pacific species was previously known in the WIO from the Saya de Malha Bank (between Seychelles and the Chagos Archipelago), Madagascar and Mauritius in 128– 300 m.
The short Alfonsino is endemic to South Africa and is known from Tongaat to Knysna. It has a white bar at the tail fin base and tail fin lobes shorter than the head . The Russian Alfonsino has no white bar and tail fin lobes longer than the head.